Home Made Grape Juice – Better Than Welch’s! August 21, 2015 by midgeguerrera, posted in Food - Eating In and Out! We all know the adage – when the world hands you lemons, make lemonade. How about when the world hands you crates of grapes? The grapes I’m talking about aren’t wine grapes. These are the yummy off the vine eating grapes. Zia Vittoria brought us some direct from the vine to taste. First stop, the internet – grape juice recipes. Nah, we don’t add sugar to anything. Next. Nah, I’m not going to upstate NY for Concord grapes. Next. How about asking around town? 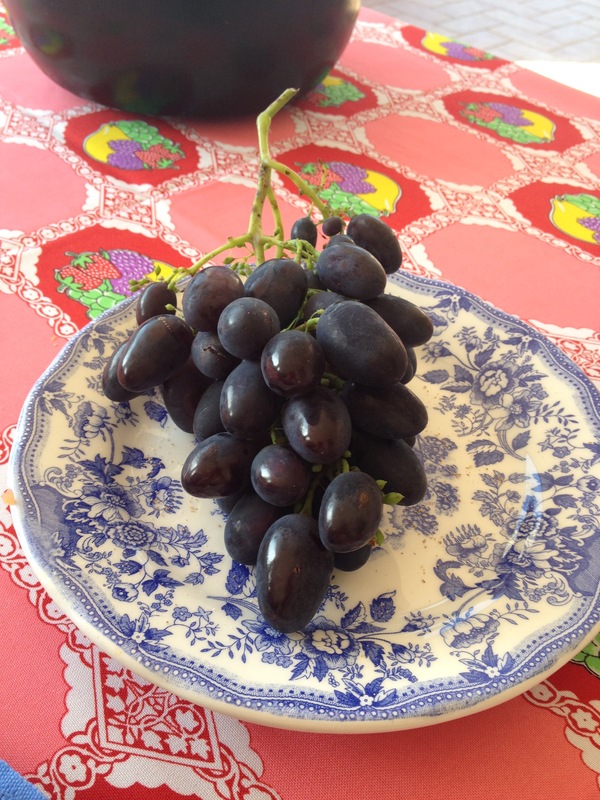 First folks looked at me like I was crazy – they’re fresh, eat the grapes. Then a wise woman said, smash, boil, strain. Damn, I can do that and I did – delicious and tons better than Welch’s. Here is the recipe – since the only ingredient is grapes it’s more like steps. 1. Pick grapes that no one has sprayed cocky poopy chemicals on or genetically modified. You are wrong you naysayer you, produce like that is still out there. Here in the no spray land of good eating we have lots of grapes “au naturel.” They can also be found in the backyards of any of your relatives who sit in the shade of the vines growing over the trellis. Take scissors with you and pick bunches. 2. Fill the sink with water and toss them in and swirl them around. 3 Put them in a scuolapasta and drain them. Notice the little worms and buggy things running around. They seem to come to life in the water. Ditch them and remember no spray means happy bugs. 4. Hold each bunch by the stem and pick off the grapes. I then tossed them in a second colander. We don’t want the ones the birds pecked or the shriveled ones. Just toss in the firm ones. I even tossed on the tiny ones. 5. 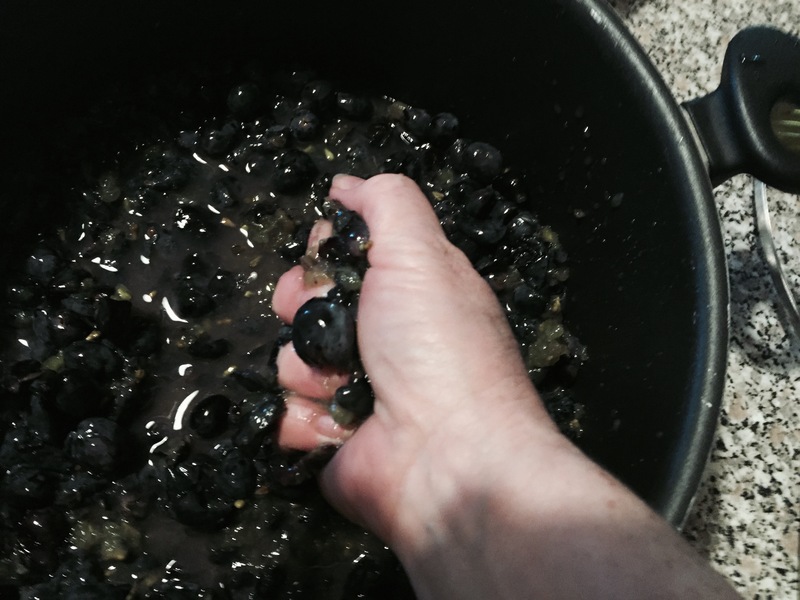 Rinse off the grapes and dump them in a big pot. Take your potato masher and mash the hell out of them. I didn’t have a potato masher and had a Lucille Ball fun time. Not my feet – my hands! I pummeled and squished and pounded and squashed. Juice squirted me the pot and the counter. I finally broke down and bought a potato masher and tried to use it for the second batch of juice. It was easier to use my hands and much more pleasurable. 6. DO NOT add anything! Put the covered pot on the stove over a low flame until it starts to boil. Then simmer it while you have a glass of wine and gossip with a pal. I of course forgot about it and think it simmered for 15 minutes plus a bit. 7. Take something heavy and squish some more – it is easier to squash hot grapes. The second time I did this I used a newly purchased potato masher to do the second squash. 8. Simmer until you are bored – I think I did it for another 5-10 minutes. 9. Line a colander with cheese cloth and set it over a big bowl or pot. I couldn’t find cheese cloth here and tried a bunch of places. My ever creative and brilliant cousin Carmella suggested gauze from the pharmacy. They had sterile gauze and it worked. 10. 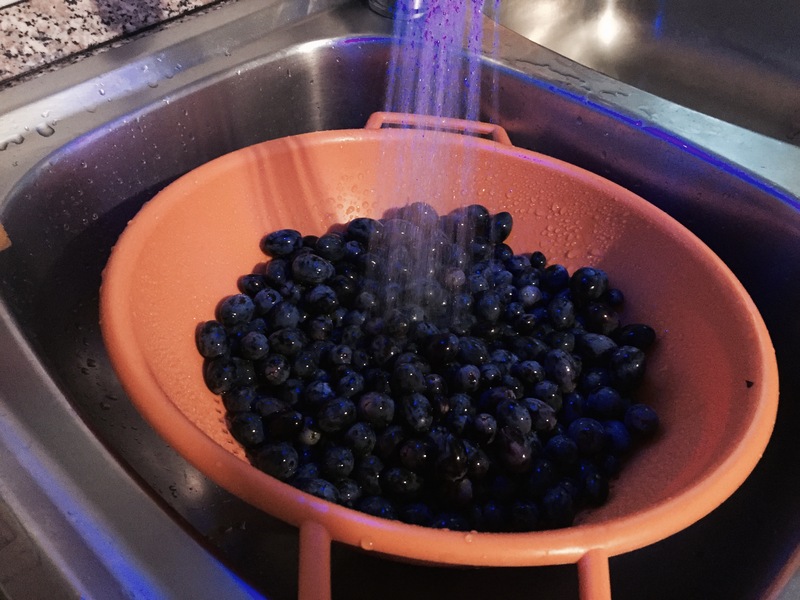 Pour the batch of grapes in the colander and cover the colander with a towel or something while it drips for a few hours. No, you must really cover the colander – why? Flies love piles of icky sweet stuff. After a few hours – how many? Well, we went to the piazza for drinks, chatted with friends, had dinner then I remembered the grapes. Quite a few hours later, I picked up the edges of the gauze and squeezed the rest of the juice out of the cooked grapes. Yes, I used my hands again to twist the fabric – like wringing out clothes – and squeezed out every drop. 11. Pour the yummy juice in bottles, refrigerate and drink. We tried it the next morning and couldn’t believe how good it tasted. Hmmm Hmmm Good! Previous postBank of America Fees Take A Big Bite Out of Vacations. I haven’t heard anyone use the word scuolapasta lately and it brings back childhood memories from when I thought everyone called it that! Although I grew up in New Jersey and was born after all my grandparents died, my mother kept certain phrases and words alive. Isn’t it amazing how anything homemade tastes so good? Sounds yummy. What a great experience to transform the abundance of the land. Have you been figuring out what to do when the abbondanza melanzana begins. Considering our husband won’t eat it. Eggplant smoothies? You are scaring me….next thing you know you will be selling it on the street wearing an apron…as you sit in a chair opening nuts…like grandma rose did. (the nuts were in the folds of her apron. )..her legs were splayed…nothing lady like about it but was she a lady!.